WIFI,SAT.TV/GARAGE/ FORESTED QUIET LOCATION! HEAVENLY,LAKE,HIKING,CASINOS NEAR! 2 BR 2 BA sleeps 6 WIFI,Pvt. Hot Tub, garage, comfy KING beds! Once you step into Tahoma Lodge you will know you are home! 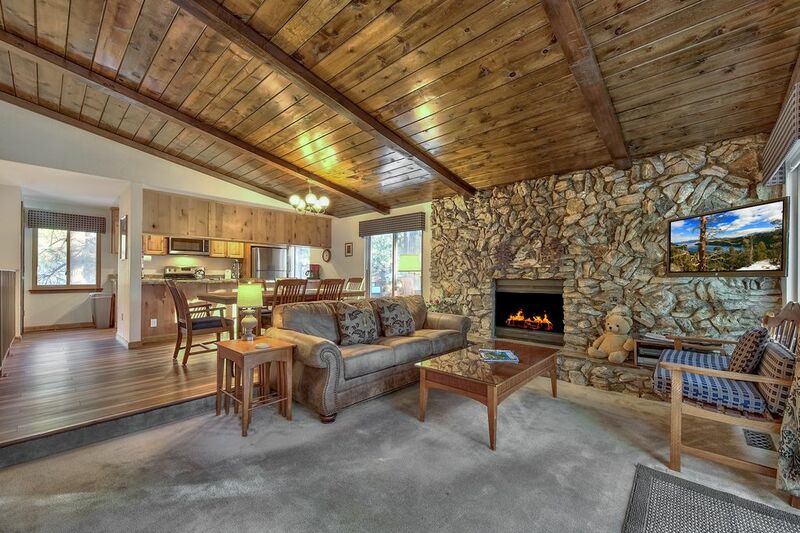 Tahoma is a 1200 SF quiet, roomy townhouse in the popular, heavily wooded Lake Village area. We have just completed a nice remodel of the kitchen dining room area (New cabinets countertops ,Range, lighting and flooring!The home is nicely furnished and has two comfy Cal King beds as well as two additional sofa beds in the living room. The master has its own bath and 32 ' flat screen TV with remote. The second bedroom has a Cal King bed. and 32" flat color TV. The living room has two additional quality queen sized sofa beds and a 40' flat screen TV.Our home has a gas fireplace & gas BBQ on our woodsy private deck. Tahoma offers Free WIFI, Dish network, and a private indoor Hot tub and a two car attached garage.There is a washer dryer in the home, a 32 'flat TV w/ remote in each bedroom,and a completely equipped kitchen w/microwave, crock pot, pots and everything for your cooking needs. As our guest you have the use of our clubhouse amenities which include a Ping pong and Pool table, saunas and when the snow melts, a heated swimming pool, tennis, courts and deluxe kids play area. Tahoma is a short walk from the forest and trails for winter snow hikes and casual hiking/biking during other Tahoe seasons. The home overlooks the mountains of Heavenly Valley. As our guest, you have use of the Lake Village heated pool, (Summer/Fall) Tennis courts, ping pong and pool tables, saunas,showers, restrooms, picnic area BBQ fire pit, and deluxe kids play areas. In addition to gaming, shopping and local star studded entertainment Tahoe offers a wide range of activities.Hiking biking, river rafting, horseback riding, fishing and water activities abound in the spring, summer and fall. Tahoe’s record breaking snowfalls afford an incredible array of adventure including; snow tubing, boarding, downhill skiing, cross country, snowshoeing, snowmobile tours, ice skating, nostalgic sleigh rides, winter carnivals, or perhaps just snuggling up to a crackling fireplace with a warm beverage and a good book. Activities: Skiing, Hiking, biking gaming, entertainment, boating, fishing, shopping, para sailing, ballooning, white water rafting, dining, vegging out... Tahoe ROCKS in every season! Area: Approximately (3/4) miles from the Casinos. Heavenly Gondola is slightly over one mile from our door. Edgewood Golf Course 1/2 mile..Safeway Grocery store and Round Hill shopping center are 1/4 mile up the road Round Hill beach is 3/4 mile, 24 hour Gym and Subway Sandwich shop Wells Fargo Bank and a Dollar Store! You name it and you can do it in Tahoe! The bottom line is we are in a very quiet location yet conveniently close to all of Tahoe's many activities. We take great pride in providing a clean, comfortable and well stocked home for all your vacation needs. Check out our great rates for a family vacation that will keep you coming back year after year! Approximately 3/4 mile from the casinos! Heavenly gondola is slightly over one mile from our door! Edgewood golf course is 1/2 mile! Round hill beach is 1 mile from our door! Zephyr cove beach and the riverboat are up the road 1.3 mile! Grocery shopping is a few blocks up highway 50! I am a retired San Diego Police Sergeant with nearly 23 years of service. I enjoy hiking, photography, refinishing antique furniture, and doing volunteer work in my community and with my church. We have taken extra care to provide the extra amenities that make this a home away from home. This includes WIFIi Dish Network,a private hot tub, a gas BBQ on the deck, comfortable beds, washer and dryer,a fully equipped kitchen from Range oven and microwave to blenders, crock pots and spices. The little things are covered too, including a hair dryer, washer and dryer and soap to handle your laundry. There is a TV in each bedroom as well as the living room area. Our roomy 2 car garage provides security and shade for you vehicle in the summer and a welcome reprieve from the Snow in the winter months. For the price of a hotel room you will get a fully furnished 1200 SF home in a QUIET location with everything you need to save money on your vacation getaway. Trees. boulders and a peek of the lake! We supply quality bed linens. Two car parking in garage plus parking for two more vehicles in front of the garage. Electric glass top stove/oven. Stove has 4 burners. Padded, comfortable dining chairs. Additional seating at bar with 3 stools. Tennis courts are available to our guest at no charge at the club house. You must bring your own playing equiptment. At clubhouse. During the summer and early fall this is available to our guests at no charge. Private Hot Spring hot tub in carpeted private room off the garage. There is a privately owned spa for nails and pampering at the entrance of the Lake Village complex. There is a shopping complex including a Safeway grocery store, Dollar Store, Wells Fargo Bank, Subway sandwich shop and 24 hour gym 1/4 mile north on Highway 50 from the entrance of Lake Village. Very nicely outfitted townhome. 2 bedrooms downstairs and kitchen, dining, living room upstairs. Clean, reasonably stocked kitchen. Hot tub is in a room off the back of the garage, sharing space with the water heater and the furnace - a bit funky. My biggest complaint is the loud heating blower during the night, particularly the back bedroom. Also, the gutter was clogged and snow melting from the roof landed all day long on the outside stairs and froze over every evening. Hostess graciously called during our stay to check if everything was OK. I would return in the summer when I could turn off the heat at night. We are happy our guest found our home to be a nicely outfitted town home that was clean with reasonably stocked.We enjoy cooking and want our guests to enjoy the amenities appliances and cookware in our newly remodeled kitchen/dining area.The furnace which is relatively new can be regulated by heating up the rooms to the mid 70's. Then in order to keep it from cycling on until the morning the guest can simply turn it down to around 60. There are at least two vents in each room and a 3rd one in the master bath. If a guest is hearing a noise from the vents they can easily adjust the vent flow with the lever on the vent. (or safely remove the vent)In the snow season water coming down from the roof is dripping off the snow filled gutter and on to the deck. Unfortunately when there is over two feet of snow on the roof the water has only on way to go and that is down! As indicated by our guest, that causes on small area on the landing to freeze overnight. Holding on to the handrail when ascending or descending the stairs is always a good idea.We would be honored to have them visit our home again in the warmer months. EXCELLENT!! Let me first start with the home itself. Our family felt very cozy, like we were at our own home. Everything was clean and tidy when we got there. As far as amenities goes there was everything that we needed to make our trip complete. The garage was perfect for those snowy days to load and unload. Being from Hawaii we felt very safe while staying here. The location of the home was perfect. It was just close enough to town if we needed to eat and pick things up from the super market. Yet far enough out of town from all the crowds and touristy feel. I can't possibly say enough about the owner Nancy. She was the perfect owner. If there was any questions I needed answered or problems I needed help with she would literally respond in minutes to get us the help we needed. I can not say enough about her. I would definitely recommend this home for winter and would definitely return here for a family ski vacation. Thank you Nancy for everything. Thanks Grant you were the perfect guests and you took great care of our home. When I go to HI I'm going to look you up! You may be able to point me towards some good VR's in your neck of the woods! We had an amazing stay. The house had everything we needed and was close to everywhere we wanted to go. The owner goes above and beyond expectations in all ways. She is extremely helpful. I would definitely stay here again. Thanks Casey, You were wonderful guests. We hope you'll return soon! We absolutely loved this cabin, a much needed get away for my party of four. Nancy the owner was so down to earth and a joy to talk, we loved everything about this place and we were so close to all the attraction South Lake Tahoe had to offer. We will definitely be back. We really enjoyed our stay. It is easy to drive to all of the parking lots for Heavenly and right down the street from Safeway. Tahoe has gotten snow and more snow this year but we were regularly plowed so, between that and having a garage to put the car in at night, we were never worried about getting stuck. The house is well stocked with all of the essentials. We would stay here again the next time we are in Tahoe. We always appreciate our guests and we are gratified that they will become members of our "family" of returning guests. In Nevada near Stateline. One mile from the casinos and less than a mile to the beaches The Heavenly Gondola is approximately one mile from our entrance. Golf: Edgewood Golf Course approximately 1/2 mile away! Ski: Heavenly Gondola approximately 1 mile away!